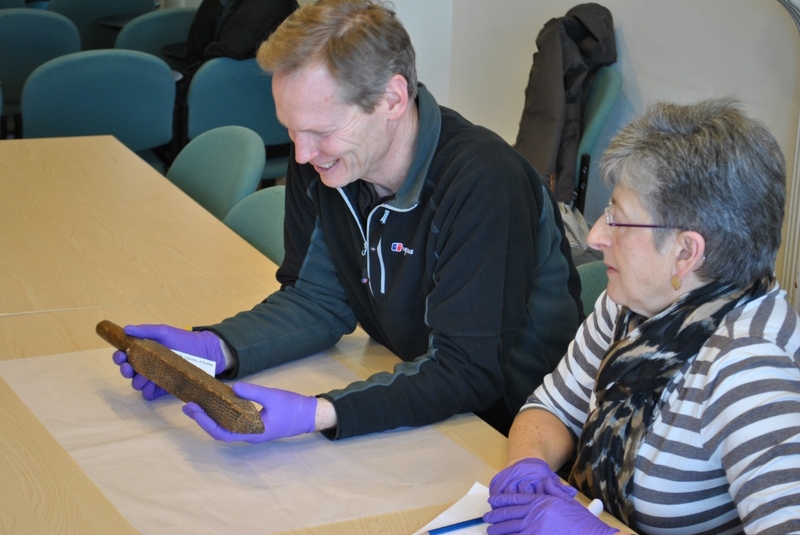 Volunteer Coordinator, Rob Davies, explains how museum volunteers are learning how to deliver object handling sessions. For the past 6 months we have been working with Museum’s Consultant Charlotte Dew to create, develop object handling sessions for visitors to the museum which will be delivered regularly by our volunteers when we reopen. We’ll also be able to provide booked object handling sessions for groups. Six session plans were devised, looking at parts of our collections that could lend themselves to a handling experience. These included everything from spoon carving to shepherding. A diverse range of objects and sessions will allow repeat visitors to enjoy and learn something new each time they visit. To ensure that visitors are provided with the best possible experience and the volunteers feel comfortable, confident and happy too, Charlotte and I have developed a training strategy. As this was the first time we had delivered this type of training and project, we planned our first session as a workshop to inform our actual training sessions. By using this model, the volunteers showed us what they needed to be taught and where help would be best placed. Two training sessions were devised; in the first session we covered the basics with some role play, the second session was focused on role play and having a go. It was important to instil confidence in the volunteers and prove to them they could do the role. This meant getting hands on with the objects, teaching the basic handling rules, i.e. two hands, hold over the table, don’t hold the handle etc. There is still a long time to go before we reopen and our volunteers will be able to provide handling sessions for the general visitor. 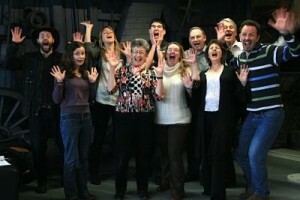 In the interim period, volunteers will continue training and rehearsing. Some volunteers are also carrying out individual research into the some of the objects for handling. When the Museum re-opens in 2016, visitors will have a chance for the first time to have a go at touching some of our objects, which we hope will enhance their experience. This week is the time of the year we stop to think about and celebrate volunteering across the country, whether you are a volunteer yourself, an organisation who works with them, or indeed is entirely run by volunteers, this is the week in which we say thank you on a national scale. 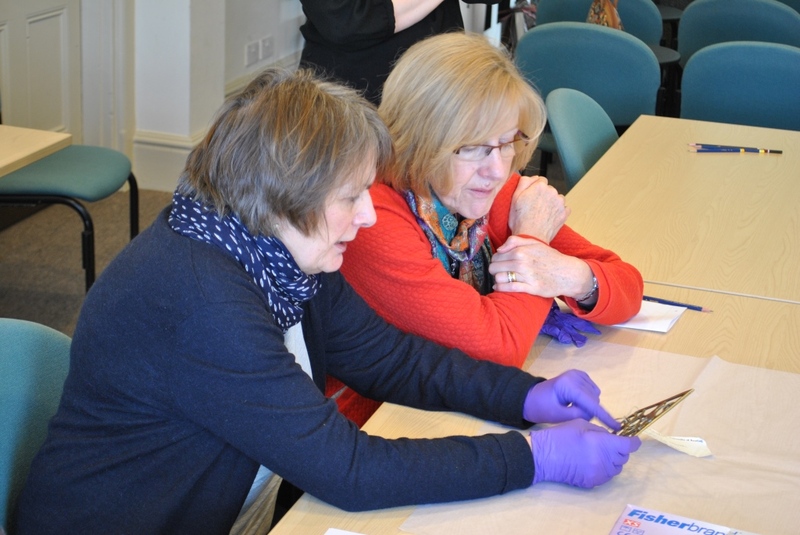 Throughout the University Museums and Special Collections Services we have about 120 volunteers who regularly give up their time to support us. Without them we would struggle to complete major archive projects on time, we wouldn’t be able to deliver major events and our output would be significantly smaller. I am extremely lucky that my role is completely focused on our volunteers as it means I get to work with a wide variety of people, I learn about a myriad of projects and I am never sitting still. I love volunteers because they are passionate and want to be here. Sometimes, during a wet Monday morning, work can be the least exciting place but when our volunteers walk through the door they instantly cheer the place up. Their warmth and cheeriness inevitably rubs off on to us. I love volunteers because I get to meet and work with a variety of people from across the local community, such as students, people looking for work, people with a special interest or people who have retired. Everyone volunteers for a different reason and I think it is great that we as an organisation can offer so many diverse opportunities, from gardening to archiving. I love volunteers because without them we wouldn’t be able to deliver nearly as much as we do. 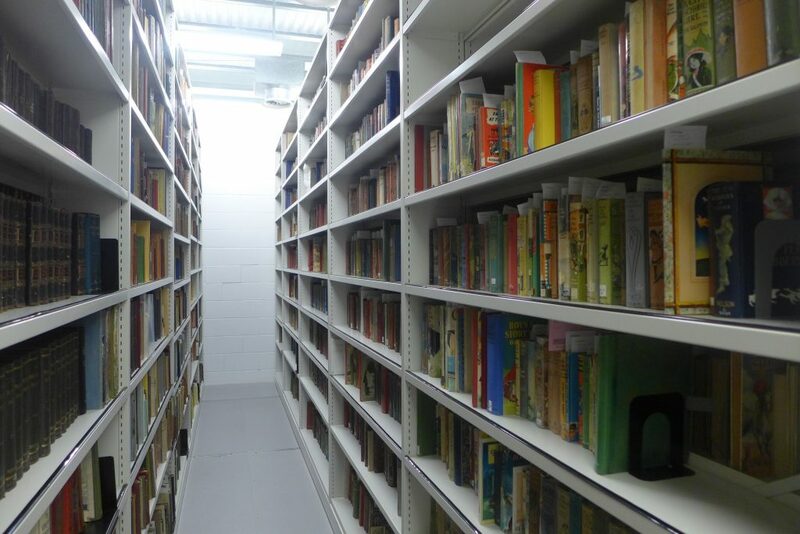 Volunteers help us deliver large projects, helping as teams on our archive projects such as the Macmillan and Longman project. 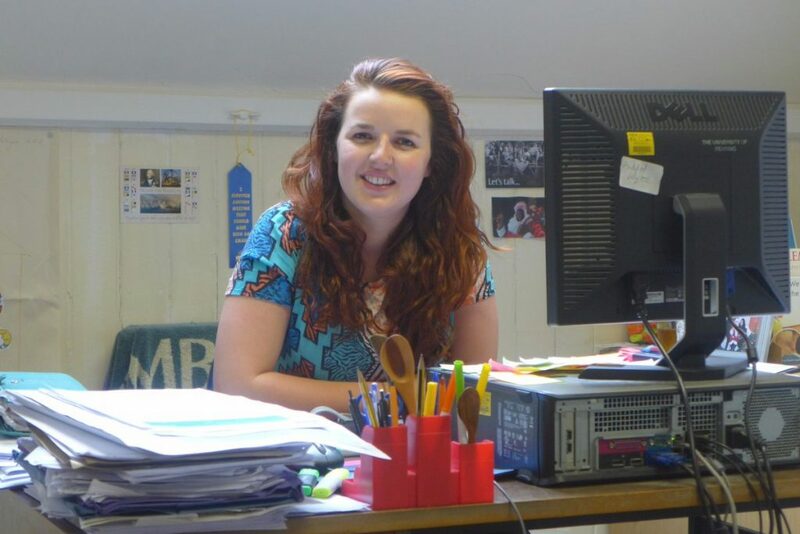 Volunteers also provide valuable support on the front desk welcoming visitors and helping out on the shop. The visitor experience is also enhanced through our volunteers, as they can go on a tour with a volunteer tour guide and learn more about the collections and see behind the scenes. I love volunteers because they bring so much to an organisation. Not only do they bring time but they bring a wealth of knowledge and experience which benefits us. Whether this is through knowledge of a particular collection, experience of marketing or managing, or even being a dab hand at knitting, everything a volunteer contributes strengthens us. Finally, I love volunteers because they make me smile. Volunteers at the Museum of English Rural Life (MERL) will present a Reading Science Week event with a difference on Saturday 22nd March. Reading Science Week is part of National Science and Engineering Week (NSEW), a ten-day national programme of science, technology, engineering and maths events and activities across the UK aimed at people of all ages. 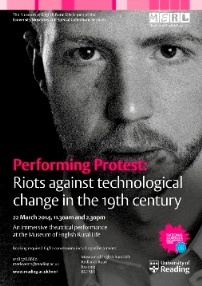 The ‘Performing Protest’ event at MERL, which is owned and managed by the University of Reading, will tackle the issue of protest against technological change in agriculture in the 1830s. The performance will tell the true story of William Winterbourne, accused of leading the rioters in what became known as the Swing Riots. The team of volunteer tour guides at the Museum have written a piece of immersive theatre with the help of Volunteer Co-ordinator Rob Davies, who has a background in amateur dramatics. They will perform the dramatic, hard-hitting production against the backdrop of the Museum which houses many of the tools made redundant by technological change, as well as the machinery which replaced them. The volunteers will play characters who bore witness during this tumultuous period, telling the audience stories of life and work in the countryside at the time. The audience will meet William Winterbourne (accused of being the illusive ‘Captain Swing’) played by volunteer Clive Pugh and will take part in a court case where they will be invited to decide whether to support him or the landowners who were trying to protect their new machinery. Rob Davies said ‘The ‘Swing Riots’ was a national crisis which engulfed the English countryside and resulted in the imprisonment, transportation and in some cases the execution of those involved. 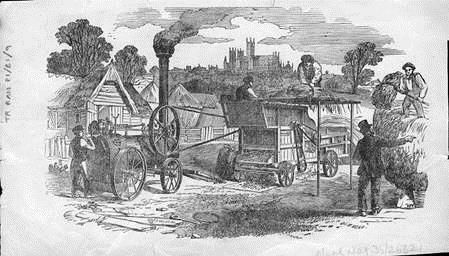 The introduction and rise of the threshing machine took the only winter work available away from the farm labourers, without this work many labourers and families faced starvation. This sparked riots and the threshing machines were attacked. We will explore the causes, events and aftermath of the Swing Riots both locally and nationally. The press are welcome to attend. Rob Davies is available for interview and high resolution images are available on request. Please contact Alison Hilton, MERL Marketing Officer on 0118 378 8660. I had a meeting with my volunteer tour guide team last week which prompted me to dedicate this post to volunteer tour guides. Tours are an excellent way in which museums engage with visitors, bringing the collections alive and making the visitor experience all the more memorable. 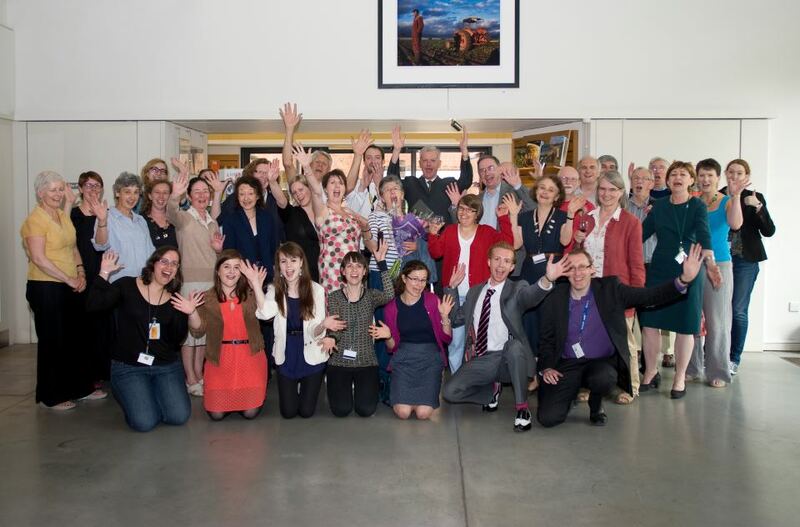 MERL has an excellent volunteer tour guide team who really are an asset to the museum. Volunteer tour guides are students, graduates, post graduates and members of the local community. The team provides general 40 minute tours around the museum on weekends and for booked groups during the week. A special part of the weekend tours is a visit to the object store on the mezzanine floor, which is otherwise closed to visitors. This is where we keep all the objects that are not on open display and it’s a great opportunity for visitors to see behind the scenes. When I joined MERL in July 2010 there were only three guides who were providing all the weekend tours and they were using a set script. The small team was struggling and needed support. I set up bi-monthly meetings with the team which still continue. I recruited new volunteers from the student body and the local community to boost the withering numbers of the team. At these meetings we discuss any problems, organise the rotas and it is a good excuse for a bit of socialising between the team. The script had originally been devised by a consultant to highlight the main themes of the new galleries when MERL moved to new premises, and was designed to provide background information about the collections. From talking to the tour guides I realised the script was no longer working for training purposes or for the visitor experience. It was hard to allow for interaction between the tour guide and their group, or to tailor a tour to the interests of the group. So we decided to take a new approach. In order to personalise the experience, new volunteers are now encouraged to choose objects they would like to talk about within their tour. The Museum is divided into sections and they choose a set number of objects from each section. They then research the stories behind their chosen objects. Each guide gives a slightly different tour but this means that the tour guide is interested in the objects they are talking about and that translates into enthusiasm and passion which hopefully rubs off onto the visitors. To assist with the facilitation of training new guides and the implementation of the new tours, we used CREW who helped us to explore new ideas, increase our confidence, mould us as a team and think about where we as a team are going. Since then we haven’t looked back; the team has continued to grow with new guides being trained at the start every academic year, which continues to boost the team bringing new life, ideas and providing visitors with more exciting tours. We have an outstanding volunteer gardening team who come, rain or shine, to tend to our gardens. We have a series of plots which have a different theme every year. In the past we have had a war-time garden, white borders and a myriad of tulips. 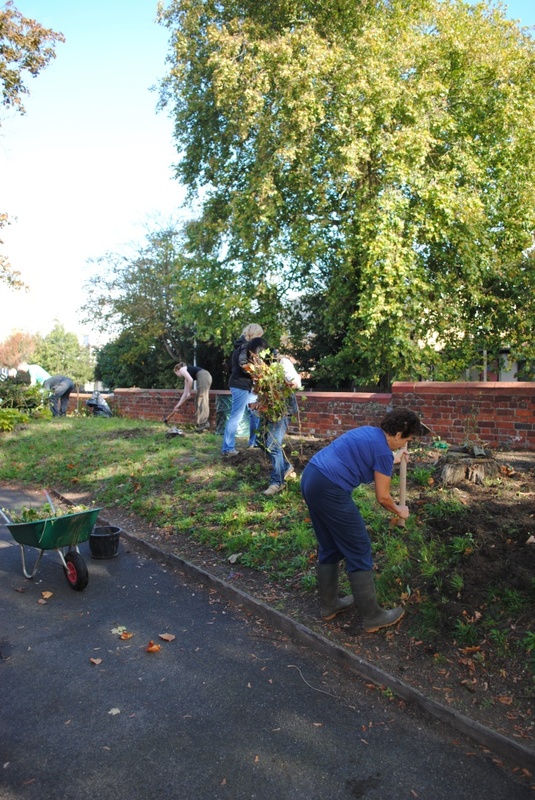 Our volunteer garden team also have worked on the National Lottery Project ‘A Green Welcome’ which has transformed our dull uninviting front garden into a welcoming and wildlife friendly space. We worked with The Conservation Volunteers (TCV) on this project, they are an inspirational organisation who work with volunteers on sites across Reading. I certainly learnt a lot from them, in particular how to make hurdle! This year we opted for plants that encourage bees. With the national decline in the bee population, we have themed our plots not only to attract and support bees but also to encourage visitors to the museum to do the same. Below, two of gardening volunteers, Tony and Roger have described the work they have done but also talk about the Bee World project which is being coordinated by the Friends of the Earth. The “Bee World” is an idea that is being promoted by Friends of the Earth. According to their website, Bee Worlds are havens of wildflowers in urban and rural spaces. They provide essential food and shelter for bees, and help reverse the trend of declining bee populations in the UK. To find out more about Bee Worlds, you can download a Bee World Information Pack from the Friends of the Earth website, or borrow a copy to use during your visit to MERL. 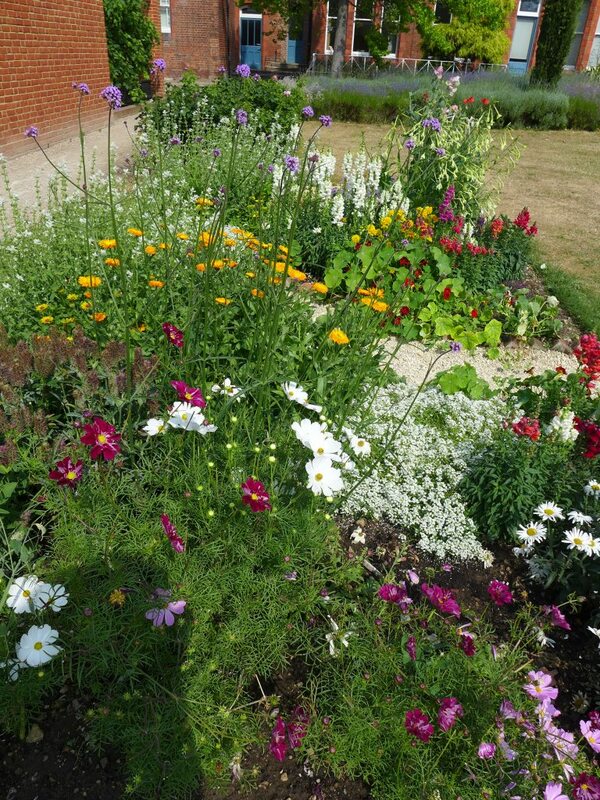 Our Bee Project at MERL has been set up to show you what you can do in your own garden to help bees – whether by leaving a part of your garden to nature’s care, or by growing a variety of flowers and vegetables that provide food for bees. Remember, bees are like people, they need somewhere to live, and regular meals. Half-hardy annuals. After the first of three beds of roses, Bed 1 nearest to the main entrance to the gardens was used to grow flowering plants that were bought from White Tower Nursery at Aldermaston. These are mostly half-hardy annuals (raised under glass and planted out as soon as spring frosts are over) plus a few perennials. They all have one thing in common: they are attractive to bees of many species. Hardy annual mixtures. 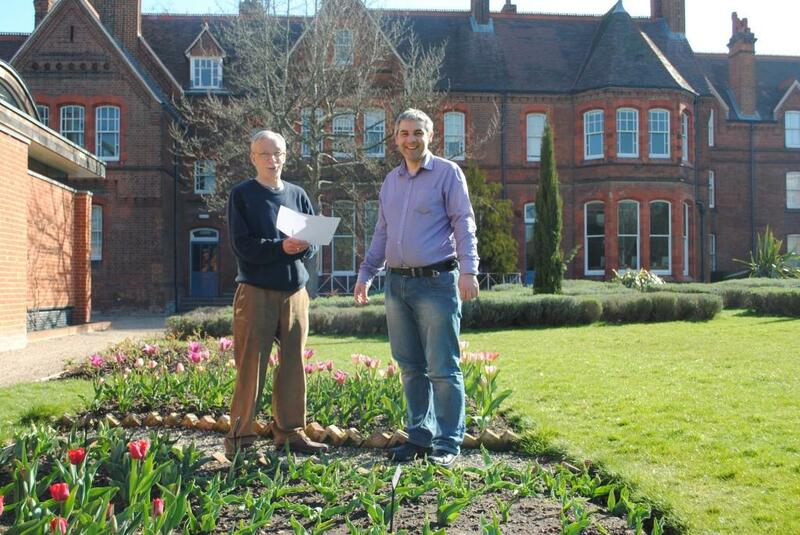 Bed 2 was divided into four sections and annual flower seed sown directly into the ground in early April. They were covered in permeable horticultural fleece to conserve moisture and maintain warmth in the early days of the spring. Four mixtures of annual flowers were grown: “Wildflower Honey Bee-friendly mixture”, “Butterfly mixture”, “Fragrant mixture” and “Fairy mixture”.Germination was excellent and by mid June many of the species in the four mixtures from Thompson and Morgan had begun to come into flower. The results were quite startling in the range of species, flower type and colour (we have still not identified many of them yet!). This wide range of species is a most important factor in supporting the population of various pollinating insects since the flowering period of so many species differs. The length of time that they were in flower was very satisfying and the later part of the summer weather was just what they needed. These beds in particular seemed to be alive with insect life for the whole summer. It is also a very inexpensive way of covering odd sunny corners of gardens with colour and interest. At the same time, they provide pollinating insects with a source of nectar and pollen during their most active period. Vegetables. We also grew runner beans, french beans and broad beans as examples of vegetables that bees pollinate. Difficult weather conditions this year meant that the early broad beans germinated badly in the wet part of the early summer and had to be sown again. The next sowing merely provided an excellent food source for black aphids as the hot weather tightened its grip. Detergent spray was used with a suitable level of outrage but ensured only cleaner-looking aphids. That’s horticulture! 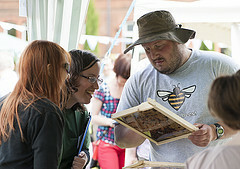 It’s summer and for us at MERL it is a very busy time for us. Our varied host of family activities means that we are very busy with a large footfall of visitors who would otherwise be at school. This is an excellent opportunity for younger visitors to explore the museum and we provide an affordable, friendly and safe environment for families. However, this does provide an added strain on the staff and volunteers of the family activities programme. In preparation for the summer activities I recruit a team of volunteers specifically for the summer; of course, I invite regular volunteers to participate as well but in order to relieve the strain on them I have the summer activities team ready too. When the summer is over I always ensure there is another project or role that the summer volunteers can feed into if they would like to continue volunteering with us. 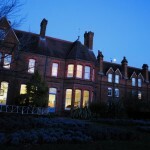 We have a large student body within the volunteer team, which is thanks to our obvious connections with the University of Reading but also down to the current climate where volunteering is seen as part of student life. This is great during term time but leaves a hole when it comes to the holidays, and I counter this hole with other students returning to Reading for the summer – it is a continuous cycle. The summer team is comprised of student and community volunteers, reflecting the volunteer programme as a whole. These volunteers are often people who have experience of working or volunteering with children or those who wish to gain such experience. 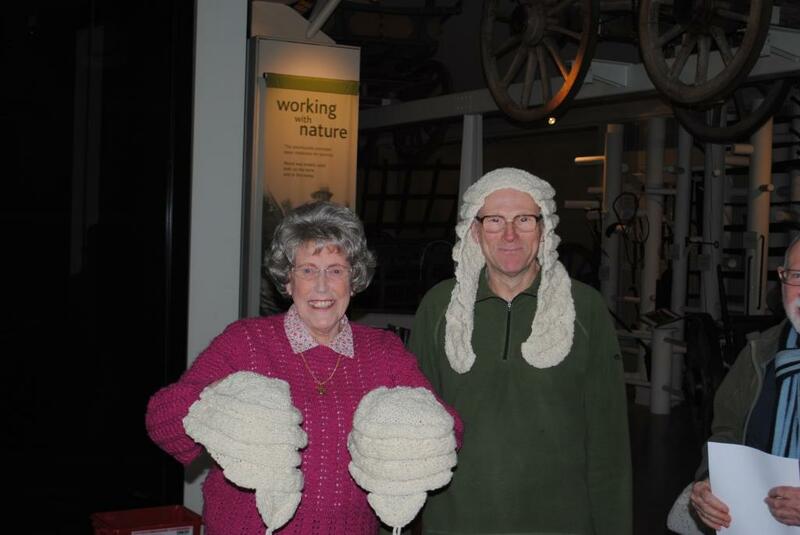 It is a great opportunity for people to experience learning and family activity sessions within a museum environment, volunteer alongside museum professionals and develop excellent skills. I would recommend inviting the volunteers to meet each other first, cover what each session will entail, plan arrivals and ensure that everyone is aware of the health and safety practice. 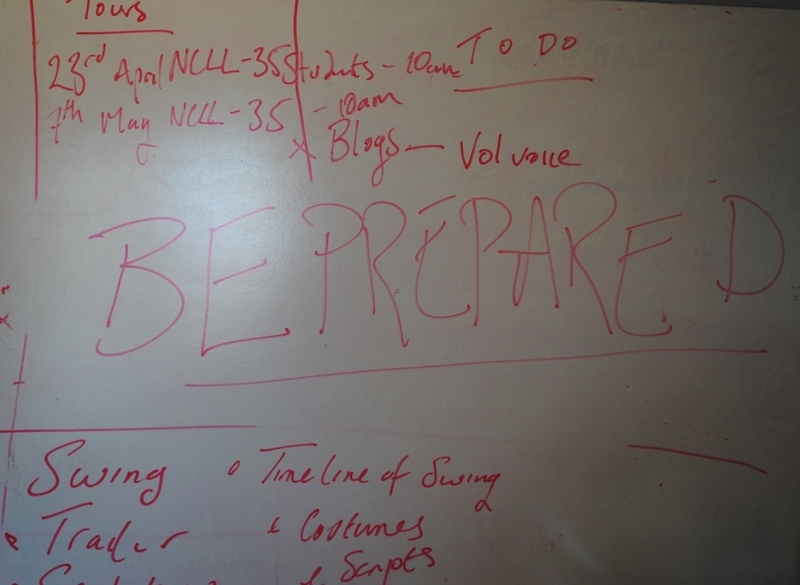 All this will help ensure that the activities go as planned. Without the strong and enthusiastic team of volunteers we would not be able to deliver such an extensive range of holiday activities. 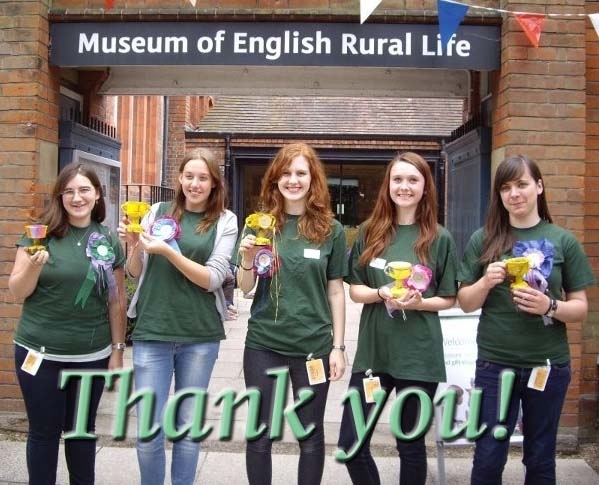 Volunteers will also be integral to our future plans for MERL in Our Country Lives, in particular because of the invaluable input and opinions of volunteers on what we can do with the museum.